Next week there is a national architecture festival organised by the RIBA. Some of the events are out there in the West Midlands and the Love Architecture website lists the regional events here. The events in Leek and Ingestre look good. For new buildings, try the Michael Baker Boathouse tour in Worcester or the Ditherington Flax Mill re-use talk in Shrewsbury with Fielden Clegg Bradley. Enjoy! I like to sketch out some rough ideas at client meetings in my notebook. I have added a little colour to this one in Photoshop. It shows the key ideas of the proposal in a very concise way, it is quick, personal and can be sent by email. 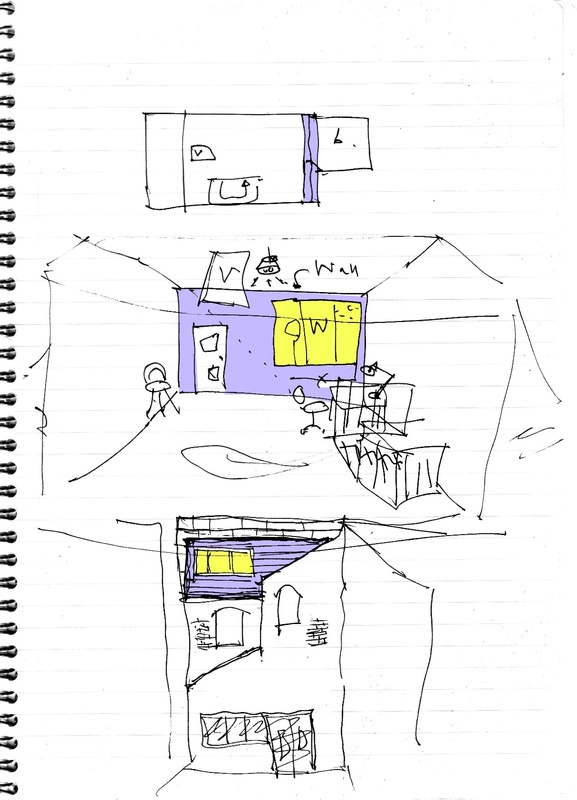 The top drawing shows the loft plan with Velux roof light, winder stair and b for bathroom. The middle picture is a through the wall perspective showing the stair, dormer with large window and door to bathroom and finally the elevation at the bottom of the page. Thanks to Tomato Wollivar for his old scanner : -). If you want to make changes to your house you will need planning permission from the local authority. You pay a fee, submit forms and drawings and they will consider your proposal against a raft of national and local authority guidelines, send your scheme out to consultation to various bodies such as the highways agency and parish council, notify the public of your intentions, make a recommendation to the planning committee and hey presto, eight weeks later you have permission. Easy. Then in 1995 legislation was introduced to grant a general permission for all kinds of small project alterations to houses, known as permitted development rights. These rights are for minor and proportionate changes, such as a small and not too tall rear extension in materials matching the existing building, or a new porch, roof light or rear facing dormer window. Permitted development rights are not an award from the local authority but belong to your house. Within the legislation is provision (under article four of the document) for the local authority to protect houses in conservation areas (such as Moseley Conservation Area) from permitted development and the rights do not apply to listed buildings, but in general permitted development is extremely popular. You can read all about it here. If you want all the gory details they are here (this is due to be replaced any day now with newer and more gory details. You know you can pay someone else to read these for you). Having a project that is permitted under PD is usually quicker and cheaper than going through local authority approval – I usually send off details of the scheme to the local authority to get confirmation that we are in compliance and then we are good to go to building control. PD has a particular benefit to my clients living in terraces who want to extend into the garden to have a larger back room downstairs or to open up into the kitchen. If they fall within the guidelines, PD projects can avoid the right to light of the neighbour’s overlooking windows, which would otherwise make the rear extension smaller, shorter and narrower. Under PD you can go back 3 metres from the original or 1948 rear wall of your house, regardless of your neighbour’s right to light. If you made the same proposals under a planning application, the local authority would have to refer to its own policies to decide whether or not your neighbour’s light was affected. If your house is detached you can go to 4m under PD. In September last year, Eric Pickles announced that he would be relaxing the planning rules to allow for rear extensions, so that proposals would be permitted going back twice as far – 6m or 8m. At the time I dismissed this as a bit of political bluster, but somehow Mr P has managed to bulldoze the legislation through in very little time with only one major concession – a right of objection from the neighbours. This creates a third route to lawful development – a special permitted development if you like. The new rules are only for single storey rear extensions built between 30 May 2013 and 30 May 2016 and article four still applies. You can read about the new rules here. The ink is still wet on this rough of the neighbour consultation scheme here. This one was done under the old PD – it’s less than 3m. 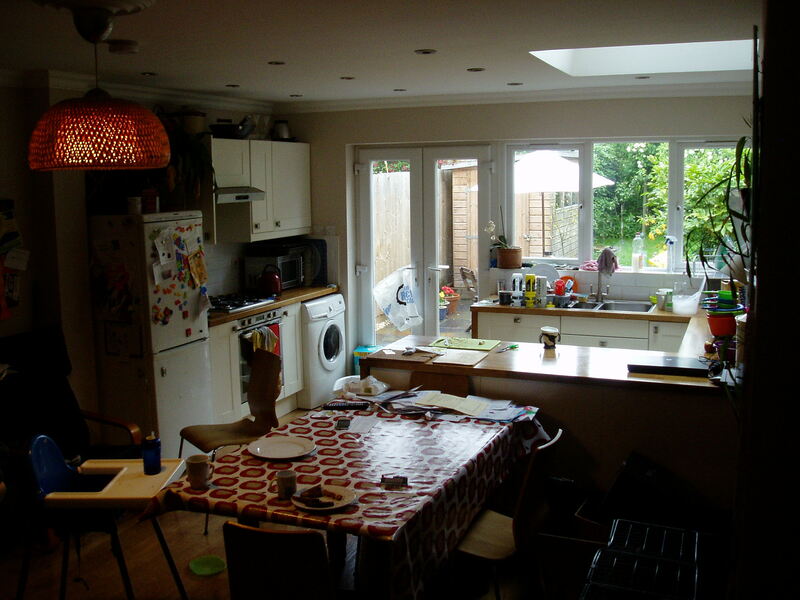 The client has added about 6m2 to the old kitchen and back room and knocked through. Not every house is laid out to allow this and of course yours might end up looking quite different, but you could end up with a new best room in the house. Check for the position of your stairs for means of escape and make sure you can still get into your garden if you have an alley access. Offer ends 30 May 2016 – and there will still be an architect’s fee. Arts and Crafts architecture is a romantic style of architecture that celebrates the handmade and bespoke. It uses materials and finishes to create a rustic effect and it breaks away from the formal symmetry of classically influenced compositions. There are good examples of rural houses but right here at the heart of things there is a wealth of amazing buildings using the style and technique of this artistic movement. Like this one on Oxford Road. We can see the waney edge oak boarding, brick and timber base with blackened oak timbers and render to the first floor. Leaded windows and low eaves with lots of roof above add to the cottage effect. It brings an anti industrial rural style into a suburban setting, in terms of materials but also in terms of spatial arrangement. For a little mental contrast think of a towny type building with a formal street frontage and a symmetrical composition. Such buildings present an arrangement of the facade that shows regularity and often use cut stone mouldings to show prestige and dignity. Arts and crafts goes against all of that with big gables breaking out all over, porches, set backs, dropped roofs projecting features and special windows, often revealing, or at least telling a story about, the internal arrangement of rooms such as the hall and stairs. I didn’t have the privilege of seeing inside this one except in my own imagination. Into the shelter of the porch after a long trek across the wild moorlands of Moseley and after knocking the great knocker on the heavy oak door, I was admitted to the oak panelled hallway. As my eyes adjusted to the coloured light filtering through the stained glass windows, through a half open panelled door I saw the light shining from the great fireplace in the hall, where, dressed in his smoking jacket and Turkish slippers stood mr Witchington reading a letter with the dark look of conspiracy in his eyes.